Successfully Added CHUWI Hi8 Dual OS Tablet - Windows 10 + Android 4.4, 8 Inch IPS Screen, Bluetooth 4.0, 2GB RAM + 32GB Memory to your Shopping Cart. The CHUWI Hi8 Dual OS Tablet combines the best of both worlds. You will have the familiar Android interface at your finger tips and the latest Windows 10 operating system on the same device. Switch between Android and Windows as you like and get the best of both. 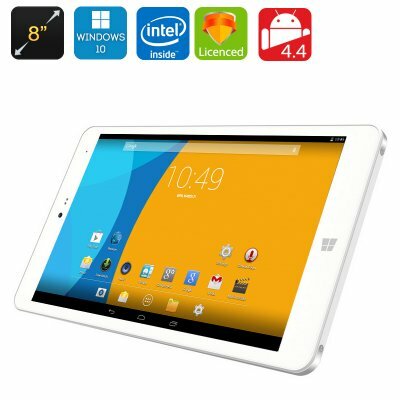 The CHUWI Hi8 Dual OS Tablet brings you the best functionality and features of the two popular operating systems. You will have the loyal Android 4.4 with access to the new tools and apps from the Play Store. Plus, you will have Windows 10 with all its upgrades, improved speed and performance. You no longer have to make the hard choice of which OS to stick to – you can have it all on one device! The dual OS tablet comes with an 8 inch IPS screen with 1920x1200 resolution, is powered by Intel Atom Bay Trail-Entry Z3736F 64bit Quad Core CPU and features Intel HD Graphics (Gen7) for amazing gameplay. You will have 32GB on internal storage and up to 64GB supported externally. The 4000mAh battery will give you up to 3 hours of continuous video watching time and 48 hours on standby. The tablet comes with Bluetooth 4.0 for easy connectivity with other devices. The CHUWI Hi8 Dual OS tablet is a great choice for those who like having diverse functionality on their tablet PCs. If you don't want to miss out on the benefits of Android 4.4 and functionality of Windows 10, with this compact dual OS tablet, you won’t have to. The CHUWI Hi8 Dual OS Tablet comes with a 12 months warranty. Brought to you by the leader in electronic devices as well as wholesale dual system tablets..